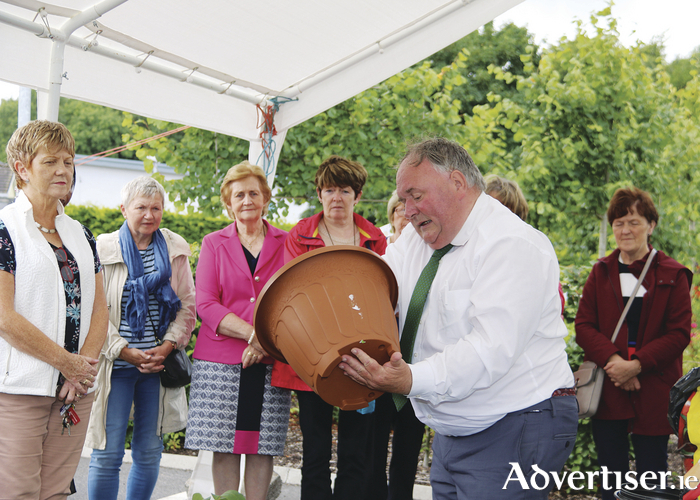 Fianna Fáil TD for Roscommon-Galway, Eugene Murphy, rolled up his sleeves at the East Galway & Midlands Cancer Support Centre in Ballinasloe for the launch of the 'Heroes of Hope' men's health garden, sponsored by the Marie Keating Foundation. Deputy Murphy was on hand giving gardening demonstrations in the polytunnel as part of the weekend celebrations, drawing on his past life as a green-fingered horticulturist. “The East Galway & Midlands Cancer Support Centre is as a beacon of hope for people with a cancer diagnosis and their families," Deputy Murphy said. "The range of services which the centre provides is staggering and this vital community service in Ballinasloe is entirely run on a voluntary basis and is totally dependent on the goodwill of corporate sponsors, local businesses, and donations from the public. "When I visited the centre a number of months ago, I was so impressed - they also have a beautiful landscaped garden and an outdoor polytunnel. In my past life I worked as a horticulturist so I have a keen interest in gardening and landscaping, so I was delighted to help out by running some gardening demonstrations on the day and the event went very well." The centre also launched a new initiative for the promotion of an ID card for people with specific needs in the community. Opened in 2008 the centre in Brackernagh, Ballinasloe has grown steadily throughout the years and they now own the building and have made massive strides in the provision of services for people with a cancer diagnosis and their families. Some 140 people go through the doors of the centre each week. The centre is open five days per week with a 24-hour phone service. Services include counselling, chiropody, art therapy, Indian head massage, Reiki, music therapy, children’s and adult’s meditation, as well as a programme designed to teach children how to deal with a cancer diagnosis. Therapies are provided by 18 fully qualified therapists and three counsellors. They also run a pilot programme for fitness for cancer patients and they are the first cancer support centre in Ireland to build their own gym. Page generated in 0.1489 seconds.